The Bose SIE2i sport headphones are made for users performing intense workouts who wish to hear their music on a headphone set that delivers excellent sound. The design of the headphones ensures that they stay in place for most users regardless of the intensity of the workout, and they also resist sweat and ambient moisture. Buyers can choose SIE2i headphones in blue, green, orange or purple, and most retailers have them priced around $150. Like most high-quality headphones, they have a wide frequency range, allowing the listener to hear deep bass and high, crisp treble sounds, which lower-end headphones often cut out. Bose released these headphones on the market in 2013. Most users lauded the headphones’ snugness and ability to stay put during rigorous workouts, especially given the earbud design and the thin, silicone over-the-ear holders. Users generally contrasted the SIE2i headphones with other earbuds, stating that they stayed in place much better than other earbud brands. 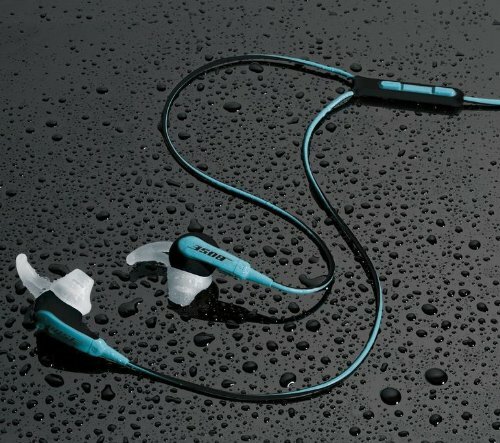 They also commented that the silicone over-the-ear holders usually cracked with other brands and that Bose’s design seemed much more durable and long-lasting, especially for runners. People who bought the headphones liked that the headphones themselves stood up well to sweating, not losing sound quality or shorting out during a workout. 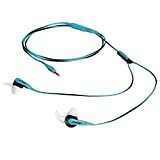 Users generally rated the durability of the cord and other components above its competitors and felt that the audio frequency range that the headphones played back was typical of other headphones at this price point. Most people reviewing the product said that they found the design comfortable and that they liked having the ability to still hear outside noises because of the earbud design. Users also liked the included armband, which was cited for having a user-friendly design and minimizing additional costs, meaning that users didn’t have to go out and purchase an armband if they wanted to use one. People also liked that the cord was also designed for durability in the event that they dropped their phones during a workout. Stay in place better than most earbuds. Greater degree of durability than most other brands. Audio quality is as good as expected by most listeners. Users retain the ability to hear ambient noise such as traffic. Inclusion of the armband means users don’t have to purchase one seprarately. The headphones stand up well to sweating. The cord is also designed to be extremely durable, especially in the case of a device being dropped. Most complaints by users related to the inline controls for volume, microphone and call answering. Despite the fact that the headphones and the cord both resist sweat and moisture, this component does not. Most users experienced a failure of this part of the device at some point. Some users also felt that although the cable was more durable than some of its competitors, they still expected a greater degree of durability for the price. Other users disliked that the main cord without the extension was too short and only worked with an armband. Inline volume, mic and call answering controls lacked durability and often failed with extended use. Some users still felt that the cable should have been more durable. The main cord without the extension is only long enough for armband use. Overall, users felt that the Bose SIE2i headphones were a good value for the money. They cited the two main factors for this as the high degree of sound quality and the fact that despite the earbud design, the headphones generally stayed put for most users during a variety of workout types. These headphones would likely make the best investment for users who wanted great sound during their workout and who didn’t want to adjust their headphones constantly or have them fall out. Complaints tended to focus on more minor issues with the product, some of which users could eliminate by the way they used the headphones. Using the volume, mic and call answering feature less frequently as well as wiping off one’s hand prior to using this feature would likely extend its life. Issues with cable durability centered less on its ability to stand up to a heavy workout than its ability to take a beating when not carefully stored. Users who throw their headset into a gym bag, locker or backseat will probably find that the cord will eventually sustain some damage, while users who store the headset in a pouch or box of some kind will most likely find that their chord stands the test of time.